And yet, while this song fits the Quran to a T, it clearly is derived from Genesis imagery. Then again, its vision of prophethood doesn’t derive from Genesis at all. This song comes from an understanding of apocalyptic prophethood, and it is very interesting to pause for a moment and recognize how ingeniously Brian May writes his own apocalypse in much the same way as biblical prophets. What makes this song distinctly from Genesis rather than the Quran? Well, while the Quran mentions Noah’s flood and the ark he built or the collection of two mates for every animal, it hasn’t yet mentioned birds being sent out to find land or the dove returning with a green branch. 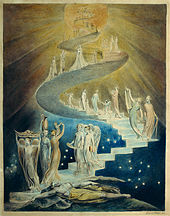 And, in a curious departure from the Noah imagery, there is also the mention of a “moonlit stair.” This image approximates artistic depictions of Jacob’s ladder. And yet, the song’s themes of repentance and reckoning are absent from Genesis. It is really worth noting that none of the Genesis characters are “prophets” in the way that we are accustomed to thinking of prophets. They do not recruit adherents, they do not teach religion to the populace, they have no orthodoxy, they have no concept of the world ever ending, they don’t really engage with others on more than a sociopolitical level. Instead of “prophets,” it is common to call the Genesis figures the “patriarchs.” Their role is not about guiding mankind or warning of destruction, rather they are the foundational figures of Hebrew heritage whose main value is their legacy of monotheism and covenants that point forward to Israel. The role of harbinger prophethood or messianic purpose as established by later biblical figures is often projected upon the patriarchs irrelevant of the actual content of their stories. It is really common to hear that Noah was rejected by his people and mocked by his neighbors. He wasn’t. At least, not in canonical scriptures he wasn’t. This depiction of Noah is rather a “midrash aggadah,” an added narrative from tradition intended to help people derive personal meaning from a scripture that otherwise is a little hard to understand. Most people can’t relate to being active partner to a violent reboot of the earth. Most people can relate to being laughed at for acting upon religious direction. So that Noah tried warning and saving his neighbors, did something seemingly arbitrary on the basis of faith, and was rejected and laughed is the narrative most of my Christian friends bring to their readings of the Great Flood story. My own husband still doesn’t quite believe me that there isn’t a scripture somewhere establishing this midrash. So Noah wasn’t actually a doom-saying messianic prophet, but actual harbinger prophets do use imagery from Noah’s story in their warnings. Noah’s flood demonstrates God’s willingness and ability to undo creation, while it simultaneously shows that God is unwilling to see creation ended and so He guides designated survivors. Doom-doom-doom-hope. Brian May likewise uses the patriarch’s imagery in the same way as any harbinger prophet, evoking the horror of the situation but promising a path for escape. I love the wind and little spattered notes that open the song. The first lyrics (which will reappear as a chorus) commence to liltingly warn of a coming storm. Everything is quietly ominous, somewhere between melancholy and sinister. But on the very last word, an abrupt clap of sound destroys the idea of a tranquil rainfall and the instrumentals proceed forward with an adrenaline-pumping pulse. The music is composed to reflect its lyric content. At certain points (such as 1:08 or 1:20) a noise unrelated to the harmony crescendos and pushes to the end of the musical phrase. That noise resembles the building feedback of a microphone placed too close to a speaker. It not only builds tension because of its dissonance, but reflects the prophet caught in a feedback loop through which his message only grows more urgent and unpleasant. These verses of prosecution, destruction, and regret are not concerned with being pretty. I also love when the chords climb chromatically to escalate towards the next coming chorus (“I see no day…” “The Earth will shake…” “God give you grace…”). While there is a lot of rhyming in the lyrics along those climbs, their final words fail to rhyme with any surround words or phrase, subverting our lyrical expectations. The chromatic climb also concludes right before the next downbeat falls, pushing us into the chorus with scarce a breath. In the middle interlide all instrumentation cuts off and the Freddie Mercury sings in canon with himself. Perhaps this represents the prophet calling for an audience and hearing only his own echoes. Or perhaps this void represents the world starting to end, and “now I know that you can hear me” means that only when it is too late do the people start listening to the prophet. In moments of assurance the tonality changes to brighter and lighter harmonies, but most of the tone of this section is edgy and dissonant. Classic text painting. The use of English’s sound quality is also top notch. Firstly, I appreciate that Freddie Mercury fully commits to distorting his articulation and pitch to create a visceral wrench in his listeners. English can be a very ugly language, and he exploits every dipthong and guttural ending when it is appropriate. Rhyme, alliteration, and assonance are all used at various points. There is no structured methods for how these devices are employed, but rather they exist within the lyrics to connect words together. Mind you that these verses do not count their syllables inasmuch as they just fit their metrical boundaries. “The Seer he said,” could have easily been “the prophet he said,” with an inconsequential tweak of rhythm, and so we can deduce that words are being chosen and arranged deliberately. Choosing the word “prophet” would have kept consistent with the title, but “seer” has a good sound quality that is heightened by its proximity to “said.” Then there is that chromatic climb worded with: “I see no day, I heard him say, so grey is the face of every mortal.” I like how “grey” comes on a downbeat compared to the upbeats of the first two -ay sounds, disjointing the rhythm of the couplet before dropping the rhymes for the mismatched “every mortal.” Then consider the phrase, “From mother’s love is the son estranged,” puts the son in a tug-of war. The vowel of “son” assonates with the first three words, but the “s” consonant starting the last two beats also connects the last two words. The son is in tension between the wholesome love and his growing isolation for love of material things. And it’s so fun to say “and two by two my human zoo,” with each oo vowel landing on a square and stodgy duple pulse. Though not my favorite part when listening, intellectually my favorite part is probably in near the end of the void when the choir of Freddy Mercuries splits into two groups. One group is singing “Come here,” and if you have are listening on stereo each iteration will switch between ears so that you are being called in opposite directions. Its is ambiguous as to whether the phrase is calling you forward for a reprimand or for comfort. Then the second choir will appear in the opposite ear from the first saying “I, you,” ambiguously communicating either togetherness or opposition. The ambiguity of these phrases is settled when you realize the two choirs are hocketed so that their words alternate with each other. They combine to say “come, I hear you.” The fragmented choirs speaking together build a phrase of empathy and reconciliation that surrounds you from both sides. So in the interlude we see the first cry of “can you hear me” is followed by the accusatory “I know that you can hear me” which is followed by the enveloping “Come, I hear you.” It is beautiful writing, really. Note that the setting of this song is in a man’s vision, as he recounts the words of a prophet. This is established in the first verse and the final chorus. The first chorus exists outside the narration of the dream, ominously hinting that the warning is true to reality as well. The conclusion has the dream haunting the man even after he awakens and the dream fades. The wind and patter-notes that open the song reappear, dubiously signifying that the storm has passed…or that it is still coming. So here we have a very profoundly written song. The use of English is quite concentrated on the level of imagery, sound quality, and overall message. Its lyrics when read flat are in an odd grammatical order, but in the context of poetic technique and when set to metrical pulse they gain coherency. The musical form structures the progression of the narrative and also adds to it. While you could question how much is deliberately meaningful and how much is happy coincidence there are similar questions to raise about any art and even scripture. I would note that the tendency with scriptural analysis is to interpret any happy coincidence as a manifestation of divine influence. And the irony of this all is that Queen was not out to make scripture, they were out to make art. Brian Mays identifies himself as agnostic, and the band Queen was notoriously hedonistic. While the images and themes of this song fit within the content of Biblical or Quranic scripture, they also do not promote any orthodoxy. The presence of God in this song is mostly an implied presence, a connotation of the Biblical imagery and cataclysmic events, and He is mentioned only once in a more generic style of reference. The story of a world doomed for destruction by its own callousness and hardness of heart, yet called to find hope in love and community is not a message that only rings true with the religious. The inherent drama and tension of a judgement begs for artistic rendering in music, film, painting, literature. These themes and images have a more universal appeal than we give them credit, and the ability to craft quality prose and poetry from them is not contained to the religious sphere. It speaks to the universality of these images and messages that an agnostic should be able to create within the apocalyptic medium so masterfully.